Available at 10 percent discount for the first week of release. Ys Seven will launch for PC via Steam, GOG, and The Humble Store on August 30 with a launch week discount of 10 percent off the regular price of $24.99 / €24.99 / £19.99, publisher XSEED Games announced. The first fully 3D entry in the Ys series, Ys Seven offers high-definition visuals at 60 frames per second, controller support, and other improvements over the PSP original first launched in 2010. The kingdom of Altago is rebuilding around a newfound peace after years of war against the merciless armies of Romn. The classic adventuresome duo, Adol and Dogi, arrive in the harbor of Altago City and quickly find themselves in a scuffle with the Dragon Knights, the kingdom’s military police body, when attempting to save a local girl from harassment by one of their commanding officers. Upset by the interruption and subsequent humiliation, the commander arrests Adol and Dogi, charging them with espionage. The king of Altago, however, having known of the duo’s pending arrival from an old trusted friend, quickly releases the pair from prison and summons them to his chambers. He tells the men about an ancient shrine that was uncovered after a recent earthquake, and asks for their help in investigating this mysterious new find. 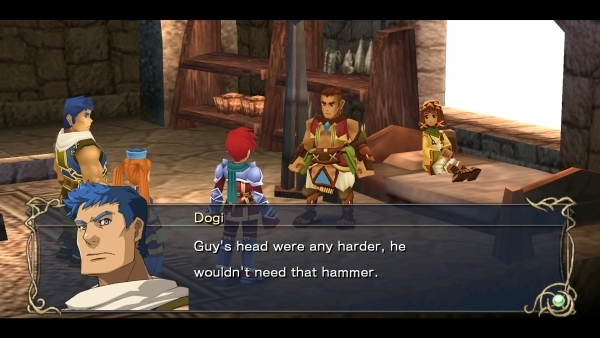 Adol and Dogi oblige, unaware that they are about to take the first steps on a long journey to save all of Altago from long-forgotten ancient forces, and to reunite the estranged five tribes who serve and protect the Five Great Dragons – deified beings who may well be the world’s last hope. Ys Seven was the first fully 3D entry in this storied franchise, the first Ys title to allow players to control multiple characters at once, and also the first title in the series to reach a wide mainstream audience in the West. Though built for the PSP system, it’s finally coming home to PC where it has been upscaled and presented in HD, complete with all the features of a modern PC release. The combat system consists of a three-member battle party with enemies engaged on the field map in real-time for fast-paced combat. Old fans of the series and new players alike will be immersed in its rich, vibrant world containing over 30 hours of gameplay. Gorgeous PSP Action RPG Gets a Modern PC Facelift – The leap to PC is accompanied by many improvements such as full HD, multiple user-configurable settings, a smooth 60fps framerate, achievements (when applicable; not offered on DRM-free version), and more. Epic Story Spanning Over 30 Hours of Gameplay – This tale of Five Great Dragons, a wartorn kingdom, ancient rites, and more spans over 30 hours of gameplay as the player ventures on an epic quest to save the world. Real-Time Combat With Epic Boss Fights – As per Ys tradition, all enemies big and small are seen and engaged on the field map in real time, with up to three party members available to swap among at will in order to fluidly strategize and take them down. New Skills Learned Through Weapons, Rewarding Exploration – Unique in the Ys series, new skills for each character are learned by wielding different weapons, rewarding players for exploring dungeons thoroughly to find every treasure.